Background: The Village has just initiated a preliminary engineering study to undertake a more detailed analysis of the transportation issues and identify potential solutions for the complex Rand Road/IL 83/Kensington Road intersection. This effort will build on the work already done as part of the recently completed Rand Road Corridor Plan. The upcoming study will also evaluate neighborhood cut-through traffic, access to the Randhurst Village, and other safety improvements in the vicinity of the major intersection. Public and stakeholder involvement will help to guide the process so that the solutions address actual needs and are consistent with the desires of the community. An additional preliminary engineering study is also being conducted for the Rand/Central/Mount Prospect Road intersection, click to view. Big thanks to everyone who joined us at the Public Open House on December 3rd. We enjoyed meeting with you and listening to your comments about this important – and challenging – intersection. Some key takeaways include issues related to congestion and wayfinding. We heard your ideas regarding opportunities for improved bike and pedestrian connectivity – as well as comments about improvements to the overall appearance of the intersection. The team will be gathering comments and working with the Village and stakeholders to develop preliminary concepts. Stay tuned! Click here to view materials. What is a Phase 1 Study? 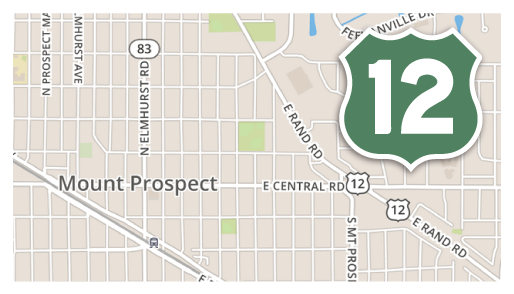 The Village of Mount Prospect’s Rand Road Corridor Plan will work to identify easier and quicker connections for drivers, pedestrians, bicyclists, and commuters to and along Rand Road Corridor in the Village. This plan also will aim to enhance safety and identify commercial markets to support potential development. The project team includes the Village, IDOT, PACE, RTA, and a team of consultants, and is supported by a grant from the RTA.